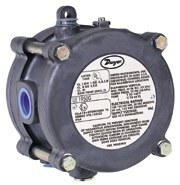 The Model 1950G Explosion-Proof Switch combines the best features of the popular Dwyer Series 1950 Pressure Switch with the benefit of natural gas compatibility. Units are rain-tight for outdoor installations, and are UL listed for use in Class I, Groups A, B, C, & D; Class II, Groups E, F, & G and Class III atmospheres, ATEX (approval pending) for EExd IIB & Hydrogen T6, and CSA & FM approved for Class I, Div. 1, Groups B, C, D; Class II, Div. 1, Groups E, F, G and Class III atmospheres. The 1950G is very compact, about half the weight and bulk of equivalent conventional explosion-proof switches. Temperature Limits: 0 to 140°F (18 to 60°C). Note: Set point drift may occur with ambient temperature changes. Pressure Limits: 45" w.c. (11.2 kPa) continuous; 10 psig (68.95 kPa) surge. Switch Type: 1 Form C relay (SPDT). Electrical Rating: 10A, 120/240 VAC, 28 VDC. Resistive 50mA, 125 VDC. Power Requirements: 24 VDC ±10%. 120 or 240 VAC ±10% optional. Electrical Connections: Internal Terminal Block. Weight: 2 lbs. 15.7 oz. (1.35 kg). Agency Approvals: CE, UL, CSA, FM ATEX pending.